This collection contains exciting contemporary pieces (solos and duets) by seven leading FJH composers that will open up a world of new sounds through bitonality, chromaticism, jazz harmonies, mixed meters, ostinato patterns, whole tone scales, aleatoric writing, and unique pedal effects - all that are fun to play! 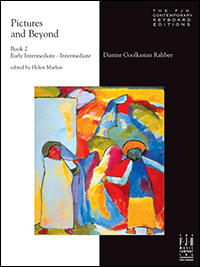 This collection will give students the opportunity to use their imagination to create their own interpretations. 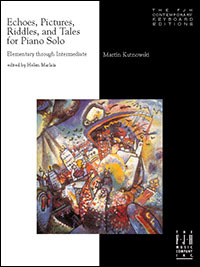 As a young teacher, Martín Kutnowski would compose a specific piece to engage the particular personality or technical difficulties of one of his students. Surprised and amused, the student would make critiques, and the teacher would make improvements. This collection of miniature piano pieces is a living testament to the spontaneity and enthusiasm shared by both students and teacher during those many studio lessons. 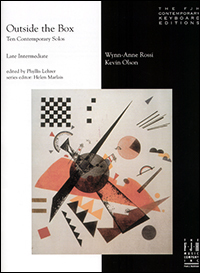 This collection gives students a taste of the avante-garde musical language of our time. Of the 25 pieces, most are two pages while some are 8-10 measures long. Spotlighting a variety of musical elements encourages students to explore their imagination. Modern techniques such as “silently press L.H. 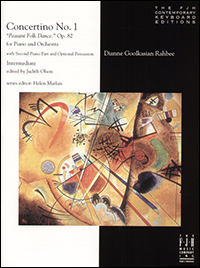 notes and keep them down the entire piece” from Whispering Harmonics, or “tap the rim of the fallboard” in Pecking and Tapping, “choose your own tempo” are some of the adventurous suggestions featured in this 32 page book. 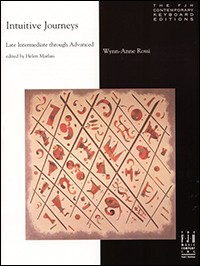 This artistic collection of over 30 piano miniatures are contrasting in nature – some are energetic, others lyrical – some are sad, others humorous. With variations on familiar melodies (Twinkle Winkle, Jack and Jill, Hickory Dickory Dock, and more) included among Rahbee’s original teaching pieces, these miniatures serve to help expand the student’s grasp of sound and texture, along with rhythmic and harmonic concepts. Use your imagination to create your very own interpretation, and enjoy these wonderful new pieces! 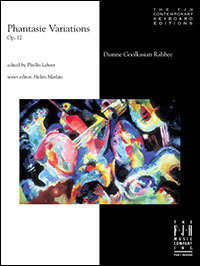 Continuing in the tradition of the great pianists and teachers who write etudes for their students, Dianne Rahbee adds to the genre with Pictures and Beyond, Book 2. The spotlight is on the different musical elements in each piece such as: intervals; rhythmic patterns; unusual scale patterns; and emotional expression. Includes a trio, a quartet (one hand for each player) a tarantella, and an Armenian folk tune. Discover and explore wonderfully modern sonorities! From lyrical (Slow, Sad Waltz, and Minor Serenade), to rhythmic (Drumming It Up), to simply amusing (Icicles, Teasing), Emma Lou Diemer asks the student to play with a colorful palette of different sounds, pedal effects, articulations, and in some cases, non-traditional techniques. These pieces are sure to bring enjoyment to the pianist and the listener. Soon you will be hooked on 20th century piano sounds with Stan Applebaum's amazing miniatures! These short pieces utilize the full range of the piano and allow the student to sense different kinds of emotions – dramatic as well as introverted. 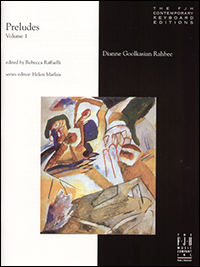 The volume includes a "tone poem," a "gentle aria," a "prelude in miniature," and a bitonal miniature: "dancing around in the Aeolian mode." You will find this collection of over 30 pieces a delight to play again and again! This composition is the first of its kind for The FJH Music Contemporary Keyboard Editions. Written for piano and orchestra, it provides a perfect showpiece for a student pianist who has an opportunity to play with an orchestra. The orchestral part has been arranged for a second piano and also comes with an optional percussion part. It is a possible modern alternative to the often performed Haydn Concerto in D Major. 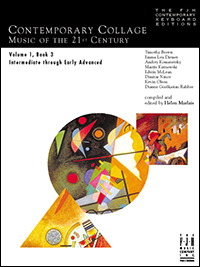 Contemporary Collage, Volume 1, Book 3 consists of 17 intermediate through early advanced original contemporary pieces from FJH composers: Edwin McLean, Timothy Brown, Emma Lou Diemer, Andrey Komanetsky, Kevin Olson, Dianne Rahbee, Martín Kutnowski, and Dimitar Ninov. 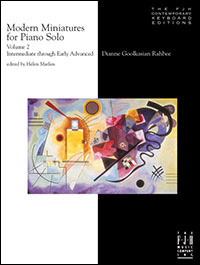 Pianists will get exposure to many contemporary sounds and techniques through these new and fresh compositions. The natural musicality present in this collection demands the same kind of careful attention that we expect from the standard canon of repertoire. 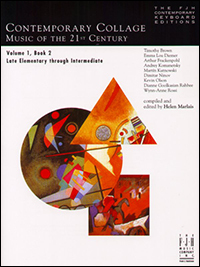 These teaching pieces follow in the modern tradition of pedagogical works by Bartók, Kabalevsky, and others; they are written to challenge a student's mind, fingers, imagination, and soul. 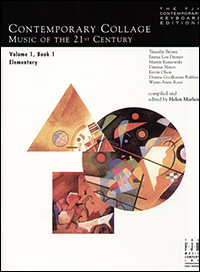 In Musical Treasures, Volume 1, students will find numerous character piano works that will broaden their musical understanding and imagination. These inventive and fun-to-play pieces will bring them closer to the intricate world of sound. 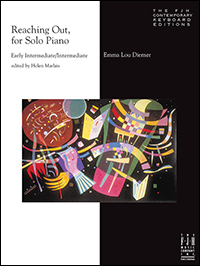 This collection explores various aspects of piano playing, including different articulations (State Fair), syncopated rhythms (Dance of the Coconuts), legato playing (Looking over a Moonlit Lake), and finger dexterity (Waltzing Bees). 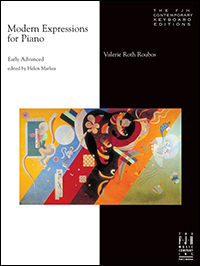 These single-paged piano pieces could serve as an introduction to the standard piano literature of the 19th and 20th centuries. 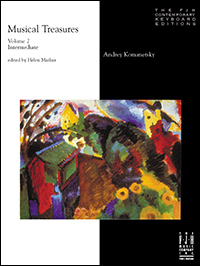 Musical Treasures, Volume 2 is an original collection of contemporary compositions by Andrey Komanetsky that provides a wide variety of interesting pieces for the intermediate level student. The pieces are composed using a broad palette of sounds, articulations, and other compositional techniques for students to gain experience in the contemporary medium. 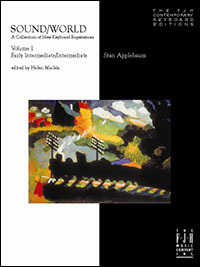 Sure to be a modern classic, this book is a witty and accessible collection for the adventurous student. Excellent survey in miniature of 20th century styles: various modes and scales, intervals (seconds large and small, thirds and fourths), various meters, crossovers and chromatic contrary motion. Pieces are 1-2 pages. Some of the titles are: Aeolian Air with Canon; Birthday Tango; Five Octave Cluster Fun; Flat Two, Flat Six; Crow-Mat-Tick; Pentatonic Parade; and Jamaican Folk Song. 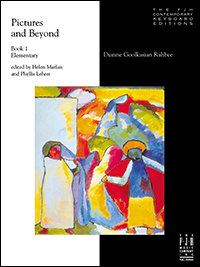 This two-volume collection of preludes contains short character pieces with a wide range of emotional expression and a wide range of technical demands from intermediate to advanced. The performer may decide to program these preludes as single pieces or in groupings in any order. While written in part as pedagogical exercises, these preludes are beautifully constructed miniatures that take an honored place among the preludes of Chopin, Bach, and Scriabin. They are written as single compositions rather than in cycles like the preludes of Bach and Chopin. Some reflect the rhythms and dance forms found in the music of modernists like Ginastera and Ligeti and many are neo-romantic in style with emotionally expressive melodic content. 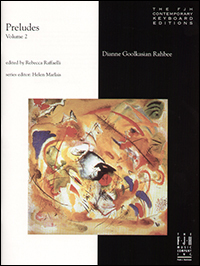 In this second volume of SOUND/WORLD, the intermediate / early advanced pianist is taken on an exciting discovery into the world of dissonance. Students are encouraged to explore these studies and then experiment and invent a study of their own. 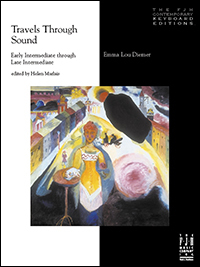 This exploration into dissonant sounds not only opens the "ears" of the developing musician, but also their imagination. 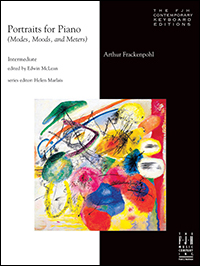 This book expands the standard repertoire with colorful techniques and textures by providing excellent contemporary music that expresses visual and emotional ideas. All of the pieces are highly suggestive of their titles: Fist Dance (play with the fists); A Harp in the Sky (dampening the strings); Old Spanish Town (tapping on the music rack); Go Fourth (a consistent interval); and some that are forceful and rhythmic–Out of Africa, The Kangaroo, and We Won the Race. This composer creates interesting music that excites the imagination, yet remains communicative. 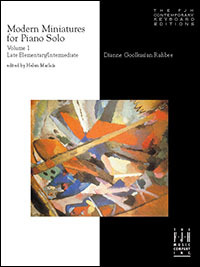 This collection of short piano images for children and adults is suitable for pianists from intermediate to early advanced levels. The pieces show poetic hints of Schumann and Chopin along with references to Latin American folk music. 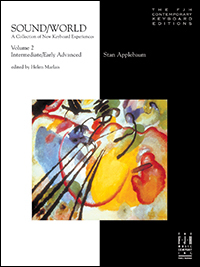 Intuitive Journeys is a late intermediate through advanced collection of piano solos that invites students to explore the emotional messages behind the notes written on the page. Students are encouraged to use their instincts and imagination to create their own musical experience, and enjoy the process of self-discovery. 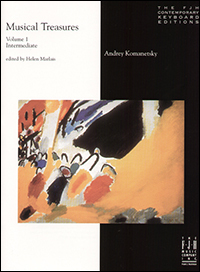 Outside the Box is a unique collection containing ten pieces that experiment with contemporary compositional techniques, altering such elements as melody, harmony, and form to create a completely new sound. Students will learn interesting ways to create new sounds and have fun playing music that is definitely "Outside the Box!" Flip through the pages of Ninov's Piano Album and they will introduce you to a gallery of musical pictures. You will "see" the sparrow leaping among the branches; you will "feel" the melancholy of autumn with its golden leaves falling; and you will "hear" the mischievous gossip spreading around the neighborhood. Ninov has always been inspired by the possibilities of depicting images through music, and so will you. Sure to be a modern classic, this witty, accessible collection is for the adventurous student. 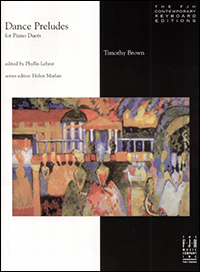 The pieces are 1or 2 pages but present an excellent survey in miniature of 20th century styles including contemporary harmonies and 5/4 meter. 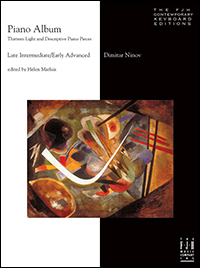 Inspired by Witold Lutoslawki's approach to form and melody, Timothy Brown has created this innovative work consisting of five preludes for the advanced pianist. Written for two pianists, this duet features simple folk-like melodies that are combined with mixed meters, dissonance, bitonality and other challenging contemporary devices. Dance Preludes is a colorful experimentation in timbre and tone color! The Phantasie Variations, Op. 12 were commissioned by Phyllis Alpert Lehrer for her Merkin Hall Debut Concert near Lincoln Center in 1980. The piece uses two 12-tone rows, opening with the first row in retrograde, as if regressing back into a subconscious dream state. The rows go through many transformations stylistically in a variety of expressive modes. At the end, the row reappears in its natural state, reverting back to conscious reality.